One reason for the Eagles' late-season surge? Better tackling on defense. 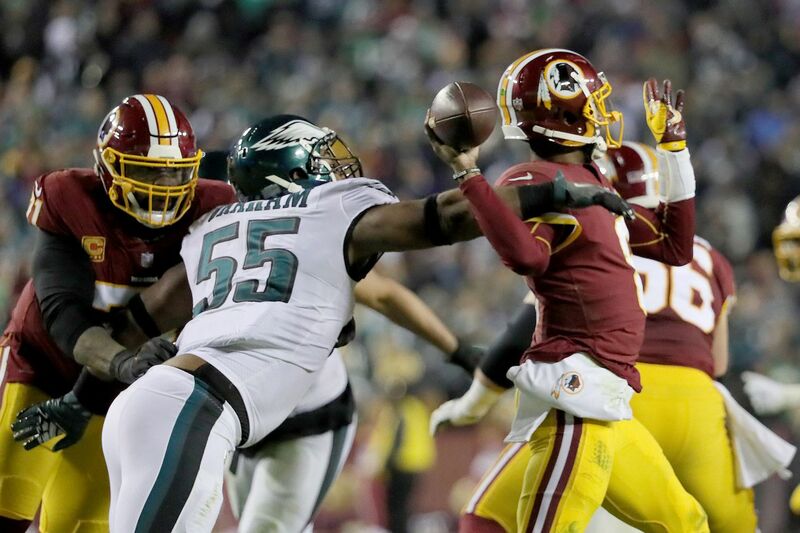 Brandon Graham (left) tries to strip the ball from Washington quarterback Josh Johnson in the second quarter. LANDOVER, Md. — It was a one play in a dominating defensive effort, but it demonstrated how far the Eagles defense has come since the record dropped to 4-6 after a 48-7 humiliation in New Orleans on Nov. 18. Since then the Eagles won five of their last six games to earn a playoff berth and the play by safety Malcolm Jenkins in Sunday’s 24-0 win over the Washington Redskins showed one reason the Eagles have improved so much defensively. Early in the second quarter in a 3-0 game, Redskins quarterback Josh Johnson had plenty of open field if only he could elude Jenkins. The Eagles safety made the one-on-one tackle, holding what could have been a huge play to a 6-yard gain. It sounds so simple, but the Eagles say they are tackling better, just as that play by Jenkins demonstrated. It all began after the New Orleans game. And the Eagles, who held Washington to 89 total net yards, corrected it largely by good old-fashioned fundamentals in tackling. Graham, who had two tackles for loss on Sunday, expanded on that thought. Like his team, Eagles cornerback Rasul Douglas has played much better recently. He has averaged nine combined tackles per game in his last five contests. Douglas jump-started the defense by intercepting a pass on the first play from scrimmage on Sunday. He also led the Eagles with six combined tackles. In addition to better tackling, the Eagles, according to Pro Bowl defensive tackle Fletcher Cox, have been coming together as a unit. That also meant tackling better.